March 14th is Pi Day, for us math nerds. This day just calls for pie. 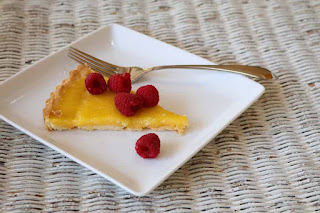 Here's a lemon pie, one which I followed (not so faithfully) from epicurious.com. I was looking for a somewhat healthy version of lemon curd, as my versions all use so much butter! Their version uses olive oil in place of some of the more traditional butter. Not only that, but they use olive oil in both the crust and the curd. I tried both, and was happy with the result. Place the almonds, flour, sugar, and butter in a food processor and pulse until the almonds resemble coarse meal, like corn meal. Add the egg yolk and the olive oil and pulse until a soft dough forms. Spread the dough into a tart shell or pie pan. Chill for 30 minutes, then bake in a preheated 425F oven for about 13 minutes, until the shell is brown all over. Remove and let cool. Squeeze the lemon juice into a saucepan. Whisk the juice, along with the zest, sugar, cornstarch, and eggs. Then, whisking constantly, bring to a boil over medium low heat. Cook for about 2 minutes. Remove from the heat, then stir in the butter and olive oil, until the butter melts. Cool. 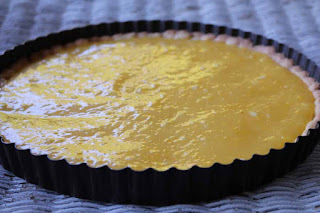 To serve: Pour the cooled curd into the cooled pie shell. Refrigerate for at least one hour, then serve. I served this with raspberries, for an added zing! Stealthy Cooking Tip: Even though I whisked constantly, there were some egg "shreds" in my lemon curd. Easy to solve! Just pour is through a colander. The raspberries added zing, and covered up any remaining white spots in the curd.